Over the last six years I’m sure you have heard the Conservancy talk about how important our grasslands are at least a time or two, or a few dozen more. But you may still be wondering why exactly grasslands are so important. Especially when compared to the visually complex and biodiverse oak woodlands, coastal scrub and chaparral that comprise the remaining 75% of Preserve lands. The answer is both simple, and complex. The simple answer is grasslands are important because of their increasing rarity and disproportionate biodiversity. The complex answer involves more nuanced layers of a legacy of invasion, a history of disturbance and the presence, or more concerning, the absence of keystone species. Have I piqued your interest yet? California grasslands are iconic to the state, in the winter season they are a brilliant and inspiring green, lush with the winter rains. In the dry summer season, they transition and are affectionately known as the Golden Hills of California, rolling off into the horizon. Many know that the vibrant green and later golden hills are actually reflections of a landscape changed by our European predecessors. 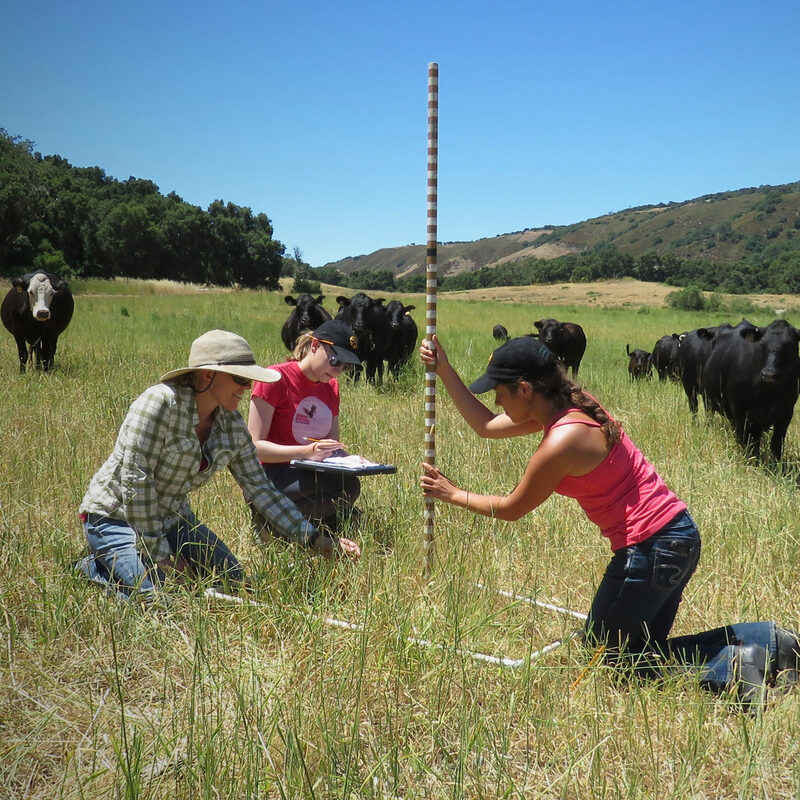 Upwards of 80% of California grasslands are actually non-native, harking back to the legacy of invasion, one foreign seed at a time. And though that remaining 20% of native grasslands may seem like a small and fleeting hope, The Preserve is endowed with some of the last vestiges of our native California grasslands. These shiny spots in an otherwise transitioning landscape are one of the many reasons that The Preserve was identified as a priority conservation landscape when the novel and bold idea of the Santa Lucia Preserve was hatched. Before the arrival of Europeans, and their pesky sock-infesting seeds, things were not without change. This landscape experienced a wide variety of disturbances from both natural forces and native peoples. Large herds of Tule elk, pronghorn and black-tailed deer – many more than today—roamed the grasslands. Every nibbled blade of grass, hoofprint and startled flight from a grizzly or mountain lion helped turn over last year’s growth, preparing the ground for the coming rains. When the rains arrived, creeks and rivers would spill over their banks and flood the surrounding areas, changing the conditions on the ground with each nutrient deposit. As the land then dried out the native Ohlone tribes used fire to sculpt the land around them, clearing poison oak, fumigating the oak trees with smoke and preparing the grasslands for the next green flush. One by one, these sources of natural disturbance regimes were removed from the landscape. In their place we now have invasive grasses, thatch build up, brush encroachment and large stands of nuisance weeds. Mimicking and reintroducing the disturbance patterns of the past is the core of the Conservancy’s management efforts with our cattle grazing, mowing and prescribed fire programs. One of the most stunning statistics of California’s grasslands is that 90% of the state’s threatened and endangered species are dependent on our grasslands. These species include the iconic and familiar California tiger salamander, California red-legged frog, tricolored blackbird and a host of other species who are at risk but holding on by their toenails. The perpetually conserved status of Preserve lands guarantees these lands will remain open and natural for these species, but it will require a partnership with these species. One in which, we manage their grasslands and they vote with their residency. This spring, we encourage you to notice the sights, smells and sounds of the complex grassland habitats. Watch the vibrant yellow Johnny jump ups, sublime shooting star and elegant Mariposa lilies bloom, smell the green grass as it reaches to the sky after the abundant winter rains, and listen to the trickling water filtering down to our creeks highlighted by songs of migratory and grassland breeding birds, such as Western meadowlark and the grasshopper sparrow. And then revel in the beautiful simplicity of spending time in them.